One has come to expect Steeplechase releases to be of such a uniformly and consistent high quality that it is easy to damn them with faint praise, as the saying goes. It seems as though the label has become a safe haven for worthy, journeyman talent rather than a place where cutting edge development thrives. If like me you have formed this impression, I have to say we are probably selling the label short and need to re-evaluate its contribution to the furtherance of the music. 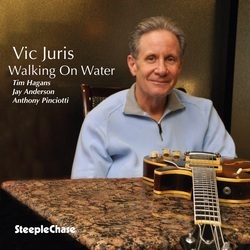 Vic Juris is without doubt a time served practitioner, a safe pair of hands, yet one who can adapt his considerable technique to serve diverse stylistic influences and this is amply demonstrated in the choice of pieces that make up this surprisingly varied recital of contemporary jazz. The tunes range from funky blues, via reflective pastoral landscapes, through the uncomfortable topography of Ornette Coleman’s inspired primitivism to the more relaxed tempos of straight ahead bop and mainstream modernity, finishing off with a spirited version of a well known songbook standard.. In his playing, Juris invokes the entire modern jazz guitar tradition which he fleshes out with soft focus harmonics and left field frissons to produce an up to date summary of where we are in the latest stylistic terms. In this endeavour he is aided by a top drawer bass and drums duo plus the incisive voice of Tim Haggans on trumpet who is at turns dramatic and intimate as the mood dictates. All the solo extemporisations are highly articulate and free of clichéd licks making for a thoroughly satisfying listening experience which, though it is unlikely to change the course of jazz will nevertheless be held in high esteem by those who care about its fundamental verities.